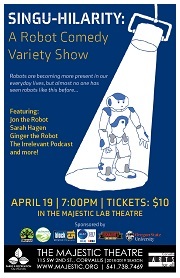 Robots are becoming more present in our everyday lives, but almost no one has seen robots like this before...join Jon the Robot (a robotic stand-up comedian) and some of our favorite nerdy, scientific, and autonomous performers for an evening of comedy, music, dance, and visual art. Acts will include stand-up comedy from Jon the Robot, Naomi Fitter of Oregon State's CoRIS Institute, Ginger the Robot, Sarah Hagen of Oregon State's Math Department, and The Irrelevant Podcast. Musical performances from the SpiderHarp and dance performances from the robot aquarium will help to keep the evening lively and vibrant. In the mood for even more robots after the show? We'll also showcase some of our favorite robot artists in The Majestic Theatre's art gallery during the week of April 15th.